Methane (CH4) is a hydrocarbon that is the primary component of natural gas and a very potent and important greenhouse gas (GHG). Unlike other GHGs, methane can be converted to usable energy. Capturing and using methane offers opportunities to generate new sources of clean energy and mitigate global climate change. Of the GHGs emitted as a result of human activities, methane is the second most important GHG after carbon dioxide (CO2), accounting for 14 percent of global GHG emissions in 2005.3 Though methane is emitted into the atmosphere in smaller quantities than CO2, its global warming potential (i.e., the ability of the gas to trap heat in the atmosphere) is 25 times that of CO2, resulting in methane's stronger influence on warming during its 12-year atmospheric life time. In addition to mitigating global warming, reducing methane emissions can deliver a host of other energy, safety, and local air and water quality benefits. These benefits make reduction projects very attractive. Methane contributes to background tropospheric ozone levels both as an ozone precursor and by contributing to global warming, which raises daytime temperatures. Studies have shown that reducing global methane emissions can lower tropospheric ozone formation and reduce associated mortalities, particularly in equatorial regions.7 In addition, many of the technologies and practices that reduce methane emissions also reduce associated emissions of volatile organic compounds (VOCs), odors, and other local air pollutants. Leachate from landfills and manure and waste from agricultural facilities can infiltrate local waters and cause disease, eutrophication, and other environmental problems. Technologies that capture methane from these sources also reduce contamination of local waters, with associated benefits to public health and ecosystem integrity. Producing energy from recovered methane can also help to avoid the use of higher CO2- and pollutant-intensive energy resources such as wood, coal, and oil. It also provides local sources of alternative energy that can spur local economic development. Agriculture (animal waste management) accounts for 3 percent of anthropogenic methane emissions. Coal mining accounts for 9 percent of anthropogenic methane emissions. Landfills account for 11 percent of anthropogenic methane emissions. Natural gas and oil systems account 24 percent of anthropogenic methane emissions. Wastewater accounts for 7 percent of anthropogenic methane emissions. Fortunately, the reduction potential from the sectors covered under the Initiative is significant, and numerous cost-effective technologies for capturing and using methane as a clean energy source (e.g., fuel for electricity generation, onsite energy, offsite gas sales) are available in every sector. More detailed information about methane mitigation opportunities and emission reduction potential in each sector can be found in Global Methane Emissions and Mitigation Opportunities (PDF, 4 pp., 2.5 MB) (December 2015). 1 Intergovernmental Panel on Climate Change (IPCC). 2007. Assessment Report 4 (PDF, 22 pp, 1.9 MB). 2 U.S. Environmental Protection Agency (U.S. EPA). 2012. Global Anthropogenic Emissions of Non-CO2 Greenhouse Gases: 1990-2030. 3 All emissions estimates, unless otherwise noted, are based on a 100-year global warming potential. IPCC 2007. 4 The presence of climate forcers, such as methane, contributes to warming effects in the atmosphere. Given its 12-year atmospheric life time, methane is considered a "short-lived" climate forcer. 5 Reilly et al. 2003. Multi-Gas Contributors to Global Climate Change: Climate Impacts and Mitigation Costs of Non-CO2 Gases (PDF, 60 pp, 1.2 MB) . Pew Center on Global Climate Change and Massachusetts Institute of Technology Joint Program on the Science and Policy of Global Change. 6 Quinn et al. 2008. The Impact of Short-Lived Pollutants on Arctic Climate . Arctic Monitoring and Assessment Programme (AMAP). 7 West et al. 2006. Global Health Benefits of Mitigating Ozone Pollution With Methane Emission Controls (PDF, 6 pp, 2.0 MB) . Proceedings of the National Academy of Sciences (PNAS). March 14, 2006 Vol. 103 No. 11 3988-3993. 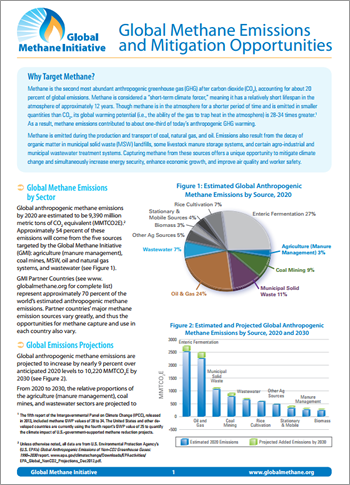 View detailed information about methane mitigation opportunities and emission reduction potential in Global Methane Emissions and Mitigation Opportunities (PDF, 4 pp., 2.5 MB) (December 2015).